Numbrix is a cool $3 puzzle game from Parade. The game was created by Marilyn vos Savant, Parade magazine’s resident genius and advice columnist. But for a few fixable faults, the game is perfection. You’re presented with a 9-by-9 grid. 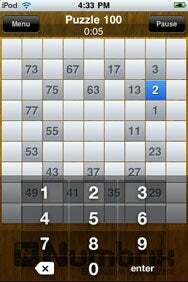 Some numbers between 1 and 81 are already placed for you in the grid—the more difficult the puzzle, the fewer numbers you start with. Your job is to fill in the empty spots, sticking to one rule: Each number must touch the number immediately before and immediately after it, either on the vertical or horizontal axis—not diagonally. Once you’ve finished a puzzle, you should be able to trace a path from 1 to 81 without lifting your finger. Like Sudoku, Numbrix requires no math. For some reason, I find that I can do the “Hard” puzzles faster than I can do the easier puzzles. Regardless, I’m pleased with the level of challenge the game presents, and I feel smart while I play it. You can compare your best times for each puzzle against the online scoreboards (but good luck—the best times are phenomenal). The game comes preloaded with 150 puzzles, and Parade promises more free puzzles are on the way. But as I mentioned, the game does exhibit a few flaws. When you enter numbers, the number pad that appears obscures part of the grid. When you’re entering numbers on the bottom rows, more than a third of the puzzle goes off the screen. You can’t drag it to adjust the view; you must dismiss the number pad, and then immediately bring it up again when you’re ready to enter another number. It’s just plain dopey, and I hope Parade can come up with a fix. I’d also love if duplicate numbers could be highlighted somehow, since I sometimes mis-tap when entering lots of numbers in sequence, and then suffer the mis-numbered consequences. Even with those negatives, Numbrix is an engaging puzzler, and I expect to lose too many hours to it. Numbrix is compatible with any iPhone or iPod touch running the iPhone 2.2.1 software update.